November is fast approaching and so it's time to get organised. This year I'll be doing NaNoWriMo, PiBoIdMo, and WNFIN, so it's important to have a game plan. Whilst I'm preparing for the challenges by plotting, making idea sheets, and doing some rough outlining, I also need to think about the non writing stuff. So let's break this down and look at each one at a time. Eating is a must. I have two small kids and so takeaways or junk food are not an option. This also fits into the stay healthy category. Eating health food will not only protect from burn out, it also helps reduce the chances of catching the numerous colds, and other viruses that go around during November. As time is also an issue I like to stock up on easy meals. - Lunches that can double up for dinners e.g. make extra meat and veg for lunch and use leftovers to make soup for dinner. - Pasta is a staple in our house (here in Italy it's a staple for most families). I make a load of ragu sauce and freeze potions, so I just have to heat it up in the microwave. Making extra pasta at lunch (where I eat it as a hot meal) and using the extra to make a pasta salad for dinner. - Jacket potatoes. These are awesomely easy. Just stick in the microwave and have a variety of toppings on hand. - I love one pan meals. Risotto is a good one. Just mix up with different ingredients each time. - Having hams, cheeses, maybe some pickles, and bread/crackers is a good idea for those days when cooking is too much effort. - Lots of fresh fruit for healthy snacking. The first time I did the NaNoWriMo challenge I had to give up half way through. I got an evil cold that knocked me out for weeks. That taught me that a big part of winning the challenge was making sure I stayed healthy. As much as I'd love to forget about house work for a month it's just not possible. Clothes need to be washed, ironed, and put away. Plates, and more importantly cups need to be washed (can't not have cups for tea after all). I make sure I'm completely up to date with clothing before the challenge starts. This at least gives me a good start. Luckily the kids are both now at school full time so this year will be easier than in the past. I'll therefore be doing most of my writing in the morning and early afternoon. That will mean I can take a break in the evening and step away from my computer. Keeping a balance is a must... for everyone in the family. Getting out and about with the kids after school does us all good. A trip to the library can be awesome for getting new ideas, entertaining the kids, and sticking up on books and DVDs to keep them busy when we get back home. Other things I include in my preparations are hanging out with friends, and sleep. November will be a super busy month with little free time. I therefore make sure I catch up with friends in October (and let them know my November plans so they know if they don't hear from me, they know why). Sleep is so important. It's really easy to get so wrapped up in the challenges and everything else that you forget how important it is to get enough sleep. Starting off well rested is a good idea. It's also a good idea to work in some nap time during November, and to make sure you don't have too many late nights. One thing I make sure I do, is have a bubble bath night once a week. One evening, once the kids are in bed, I dedicate to pampering myself. A nice, long soak in a bubble bath. Maybe a face mask, manicure or pedicure, followed by an early night. It does wonders for restoring energy levels. 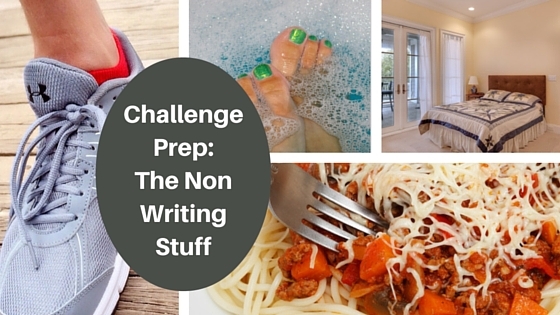 What non writing planning are you doing? Share your tips for November challenge survival in the comments section below. To be serious, I am going to make some "take this out of the freezer and nuke it" meals ahead of time and prepare the birds' frozen veggies in baggies so everything is very organized for November. There are a number of daily tasks that could be streamlined for an author's everyday life all year 'round if we took one weekend a month to do that kind of prep work, but I think the creative mind works in opposition to the organized mind at times. November will be fantastic! So true. A little extra organisation would make a big difference to everyday author life. I always think I should be this organised all year round but never seems to last too long. I am improving though.